My dad is a classic steak and potatoes kind of guy, so for Father's Day, I already knew what his answer would be to "What do you want for dinner?" So I set out to do a variation on this theme, which included fries! The steak was marinaded in a mixture of chipotle peppers and cocoa powder (yes, you read that right, cocoa powder). 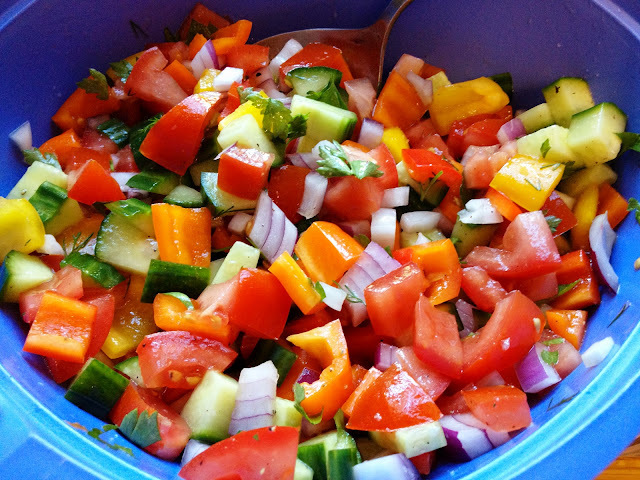 The veggie salad was a combination of tomatoes, peppers (sort of like bell peppers, but we had these tiny ones in various colors that are also sweet), cucumber, red onion, fresh dill, fresh parsley, olive oil, white balsamic vinegar, salt and pepper. 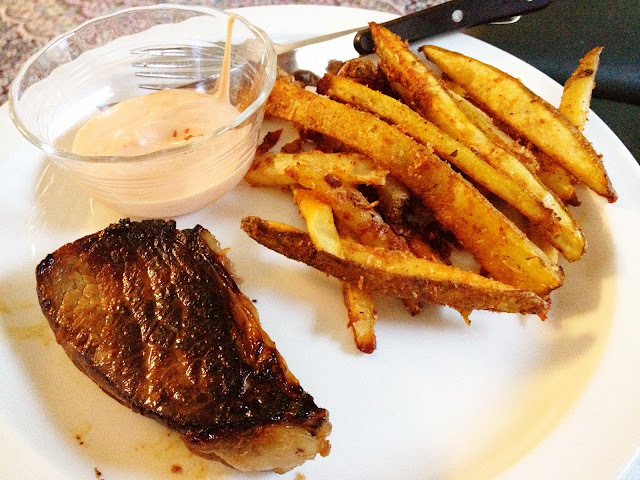 The sauce I served with the fries was called "Fry Sauce" and is just equal parts mayonnaise and ketchup, with a little Sriracha thrown in for fun. 2. Pat the potatoes dry and cut them lengthwise into 1/2-inch-thick slices. Turn each slice flat and slice again lengthwise into even 1/2-inch-thick fries. Place the potatoes in a mixing bowl and add the olive oil, seasoning and 1/4 teaspoon salt. Toss well to combine, then transfer the fries to a large baking sheet and arrange them in one even layer so that they are not touching. Roast, scraping the potatoes from the baking sheet with a metal spatula and turning them over halfway through, until golden brown and crispy, about 30 minutes. 3. While the potatoes are cooking, combine the cheese, paprika, garlic powder, onion powder and 1/2 teaspoon salt in a small bowl and stir to blend. When the potatoes are crisp and brown, sprinkle with the paprika-parmesan salt. Serve hot.